Three questions with Barbara Nevins, owner of Southwest Cafe. I started my business 31 years ago. I had been working in restaurants for other people for about 15 years all around the country -- including Taos, New Mexico. Being from Connecticut originally (Redding), I decided to bring my love for Northern New Mexican food to New England. I took a chance on opening my own restaurant. Looking back on opening Southwest Cafe, August 1, 1987, I am amazed at how we have evolved over the years. From a "5 table taco stand" to employing experienced chefs and a beautiful outside patio, Southwest Cafe has been my dream come true. I can't imagine not having my small business all these years. This question makes me laugh! After 31 years, I'm definitely a "senior from the community" myself! I employ between 17-20 people and at least a third of them have been with me for over 20 years! We have a manager for 30 years, a line cook, and 3 full-time servers/managers-22 years; 3 others for 10-12 years. My employees are the most important aspect of my business. No business can survive without good people involved and who care about what they do. I can honestly say, I have the BEST! Each person cares about Southwest Cafe and each one brings something a little different to the table. 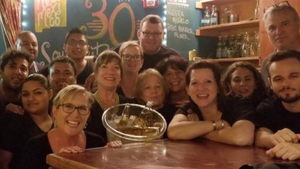 From day to day management skills to decorating the interior, to my wonderful seasonal flowers and outside art on the patio, Southwest Cafe would not exist without the Southwest family.. we all make it work together. How many local businesses do you use to support your business? Southwest Cafe has always tried to support other small businesses. No business is an island unto itself. We all need and support each other as much as we can. There are many we work with but the ones who immediately come to mind are here in the Marketplace. Ridgefield Organics- I don't know what we'd do without having wonderful produce right next door for specials and grabbing a few extra avocados after running out of guacamole on a busy Friday lunch. Lisa and Sal are great neighbors. 109 Cheese and Wine have provided wines to our customers after wine dinners, as well as delicious cheeses for specials. Sarah and Bernard have actually co-hosted wine dinners with us...Sarah working the front of the house with me and Bernard cheffing in my kitchen--SO fun for everyone, and a chance for us to introduce Southwest Cafe customers to Sarah's Wine Bar and Bernard's restaurant and some of their customers to us. Also, we love and support Allison Stockel and the Ridgefield Playhouse any chance we get. People come to town from all over for a show and need places to eat first. The venue helps the town tremendously, bringing out the locals as well as out of towners. Southwest Cafe happily provides food for their performers and their fundraising galas.Another person is Erin Nazzaro, a wonderful artist whose work we've sold right off the walls of Southwest Cafe during dinner service! She is a local artist painting vibrantly colored Mexican art allowing us to enhance our atmosphere. There are many more town connections.. too many to name but all are important in creating small business friendships and working relationships. Southwest Cafe is located at 109 Danbury Road, the Marketplace at Copps Hill. Visit them online here. Southwest Cafe tags Ridgefield Apartments! Why Small Businesses Matter in Ridgefield was started in January of 2018 when HamletHub met with Jeff Konchalski, owner of Nature's Temptations about the need for small businesses to be recognized. By putting a spotlight on the local merchants who donate their time, talent, goods, and services for the betterment of our community, Jeff Konchalski wants to stress the importance of shopping and supporting everything local.